We are not responsible for any settings issues, it is your responsibility to make all the features work with your carrier. after 48 hours we will not honor any complain regarding defect or any other issue related to phone. 15W of charging power in a device that fits in the palm of your hand. Safe and Efficient- UL Safety Approved and Level VI High Energy Efficiency Certified. NEW Original Motorola Charging Cradle Case for ELITE Sliver 2 II HZ770. Motorola Charging Case for Motorola Elite Sliver 2 II HZ770. Either way, we have good news for you, you chronic Bluetooth-er. Better yet, this case is smooth, stylish, and discreet, so it'll fit nicely in the pocket of your tailored Armani pantsuit. The model number is P4000. You can also set fuel-gauging sleep settings to maximize and conserve energy capacity. The Motorola P4000 contains no BFRs or PVC and is certified carbon-free. Works with everything under the sun. 15W of charging power in a device that fits in the palm of your hand. Trending at $12.99eBay determines this price through a machine learned model of the product's sale prices within the last 90 days. USB-C enabled smartphones and tablets MOTOROLA 15W / 3A. Part Number: SPN5864B / SSW-2680US. Motorola Droid Turbo. Moto G4 plus. Moto X Play. •20% RESTOKING FEES APPLY. 15W of charging power in a device that fits in the palm of your hand. Safe and efficient- UL Safety Approved and Level VI High Energy Efficiency certified. EXPEDITED OPTIONS ARE ALSO AVAILABLE. TurboPower 15 can be used with most devices that use the new USB Type-C technology. The USB Type-C connector is a reversible plug, which allows it to be plugged in either direction. Motorola Moto Z Force Droid. Fully operational and functions as intended. Compatible with Motorola Droid Turbo 1, Turbo 2, Ultra, G3, G4, G4 Plus, X, X Pure. Product has been inspected, tested, and cleaned. Has surface scuffs and scratches. Power output. Para funcionalidad, ofrecemos una garantía de 60 días. Política de devolución Salida de potencia. Compatible devices: Moto Z, Z Play, Z Play Droid, Z Force Droid, Moto M, Moto Z2 Force, Z2 Play. Moto Z3 Play, Moto X4, Moto G6, G6 Plus / Samsung Galaxy S8, Galaxy S8 , Galaxy Note 8 /. You may also like. Model Number: S025KU1200215, SPN5886A Output - 5V - 2.85A. Compact and light weight can be taken anywhere. Simply connect the included micro-USB cable to your device, insert the other end into the USB adapter, and plug into any available electrical wall outlet. 1 detachable micro-USB cable provides power to the device via your computer's USB port, as well. Turbo: 9V/12.85A (25W). 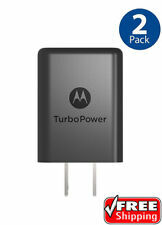 Give your compatible Motorola phone 10 to 12 hours of battery life in just 15 minutes of charging. Plus, give another device up to 8 hours of power in 15 minutes of charging using the second port. Trending at $9.88eBay determines this price through a machine learned model of the product's sale prices within the last 90 days. 15W of charging power in a device that fits in the palm of your hand. Compatible with Moto Z, Z play, Z force, other USB C (Type C) devices. Safe and efficient- UL Safety Approved and Level VI High Energy Efficiency certified. Plus have peace of mind that your device is charging with the Convenient LED indicator light. Never slow down. Color Black. PART # - SJYN0645A, 89444N. COMPATIBLE MODELS - MOTOROLA XOOM. We are unable to help with APN settings / browser / mms settings etc. 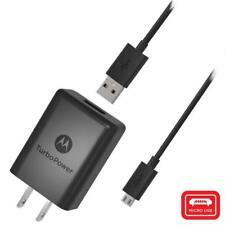 Original OEM Motorola Travel Wall Adapter With Micro USB Data Sync Charging Cable. OEM Motorola 3 Feet Micro USB Cable. OEM Motorola 0.85 AMP Wall Charging Adapter. TurboPower 15 can be used with most devices that use the new USB Type-C technology. The USB Type-C connector is a reversible plug, which allows it to be plugged in either direction. WWhat Is Turbo Power?. Don't let your cell phone battery die when you're out and about! They work very hard to get quality products to you quickly. Easy charging through your vehicle's auxiliary socket. I205, i215, i265, i275, i285, i305, i325, i355, i365, i415, i450, i530, i570, i580, i670, i560, i615, i605, i710, i730, i733, i736, i760, i830, i836, i850, i855, i860, i870, i880, i920, i930. We Contribute. Do you need more accessories for your phone?. The compatible device manufacturer does not necessarily endorse use of NON-OEM products. The original manufacturer's warranty DOES NOT apply. Ports: USB Type-C™ plug on attached cable. 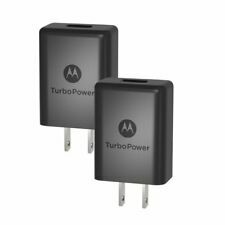 Compatible with Moto Z Force, Moto Z Force Droid, and Moto TurboPower Mod. Safe and Efficient- UL Safety Approved and Level VI High Energy Efficiency compliant. Compatible with any device with a USB Type C charging port. Small and lightweight for convenient portability and storage. Trending at $5.50eBay determines this price through a machine learned model of the product's sale prices within the last 90 days. Moto Z Family, Moto Mods and Moto X4. Power Output: 15 Watt. INCLUDED IN BOX. Input: 100-240 VAC, 50/60 Hz. 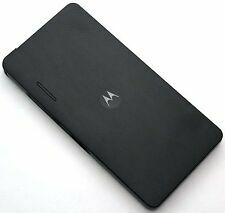 Such as the New moto X、Droid Turbo、Nexus6、Moto X pro、X style、X force,Motorola DROID TURBO 2, MAXX 2 - 25W of power. Other Micro USB-enabled phones and tablets enjoy up to 25 watts of blisteringly fast charging.